To the untrained eye, the new Aqua Cutter 410a Evolution may just look like another piece of Robotic Hydrodemolition equipment but that’s where you’re wrong! This small, compact, versatile machine is paving the way for the new era of hydrodeomlition equipment. Despite its small stature, the Aqua Cutter 410a Evolution is jam packed full innovation and design to create a more precise and safe hydrodemolition experience. These robots don’t waste any time getting the job done and a quick job is not a rushed job when it comes to the Aqua Cutter. This machine works in an efficient way ensuring there is less downtime helping you to finish the job quicker. 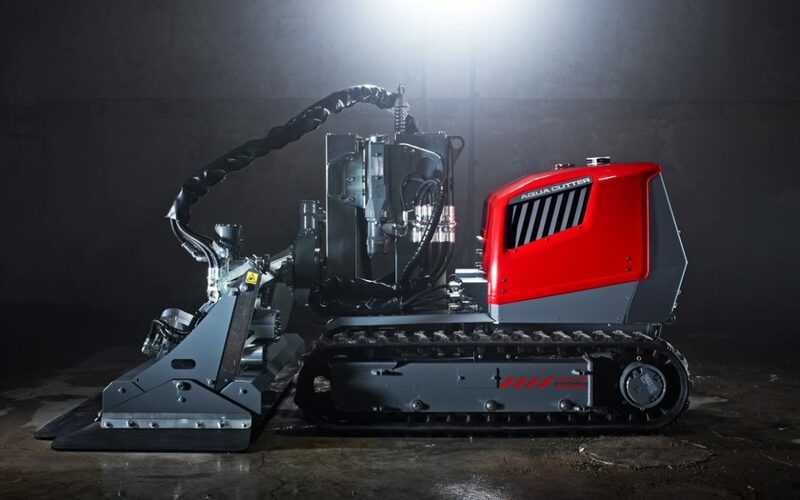 Looking at the compact design, you’d assume that this machine is only suitable for smaller jobs when in fact it is one of the most versatile hydrodemolition robots on the market. Locations where you can use the Aqua Cutter include Parking Garages, Buildings, Tunnels, Nuclear Plants, Hydropower Plants, Petrochemical Plants and Waste Water Plants, just to name a few! It’s small and light which makes it the perfect tool for areas which are harder to reach. Traditionally hand-lancing was used for hard to reach areas as no other machines could be used safely. Hand-lancing is a very physically demanding form of Hydrodemolition which can cause fatigue among operators making it quite a dangerous method to use. The Aqua Cutter instantly removes the danger by allowing the operator to stand at a safe distance away from the robot using the Power Control Module. Using the Power Control Module allows the operator to use the wireless control to operate the robot and drive it into tight and inhospitable environments whilst remaining safe. AQUA CUTTER 410A – Åre cableway – Aquajet Systems from Aquajet Systems on Vimeo. The Equal Distance System (EDS) is a tool which keeps a preset distance between the nozzle and the concrete surface. This system reduces wasted energy and keeps the water jetting at a consistent and powerful speed. The Evolution Model is different to the classic model because it includes a highly computerized robotic management system. This not only improves its consistency but allows you to be a little bit more creative with your concrete removal. The system allows the operator to programme geometric shapes such as circles, squares and triangles for the robot to cut. This freedom allows you to create a more professional and sophisticated hydrodemolition result. AQUA CUTTER 410A performance demo – Aquajet Systems from Aquajet Systems on Vimeo. Is the Aqua Cutter 410a Evolution Right for Me? If you are unsure about whether the Aqua Cutter 410A Evolution would be suitable for your task then don’t hesitate to contact us as we are pleased to offer helpful advice for your unique situation. Call us on 01677 428 786 or email us at [email protected]. We look forward to hearing from you.